Don’t write off these faux fruits de mer as the asparagus water of the seafood world: There’s some serious plant-based wizardry going on in the kitchen over at Crossroads. Chef and owner Tal Ronnen—along with executive chef Scot Jones—have already been turning vegan seafood lovers’ heads with their “Artichoke Oysters,” a permanent menu item that combines artichoke puree, kelp caviar, and fried oyster mushrooms to create a slurpable experience meant to mimic the briny mollusks. But the team of chefs recently got so inspired by a single, seafood-like ingredient that they built an entire tower in its honor. “Lobster Mushrooms are true treasures of the earth,” says Ronnen. “The naturally seafood-like flavor of Lobster Mushrooms inspired the tower and it all developed from there.” But a seafood tower can’t get by on lobster (mushrooms) alone; the chefs are toying with other other high-end produce to complete the ensemble. Crossroads is using hearts of palm sourced from One Earth Farm in Costa Rica—because they’re harvested sustainably—as a proxy for calamari. Also nestled in the tower are clams casino made with smoked shallots that act like bacon, Crossroads’ signature heirloom carrot lox, and oyster shooters made with shiitake mushrooms that have been poached in olive oil and kombu. And what would an authentic seafood experience be without that frightening price tag that reads “MP”? Don’t worry, Crossroads has that too. 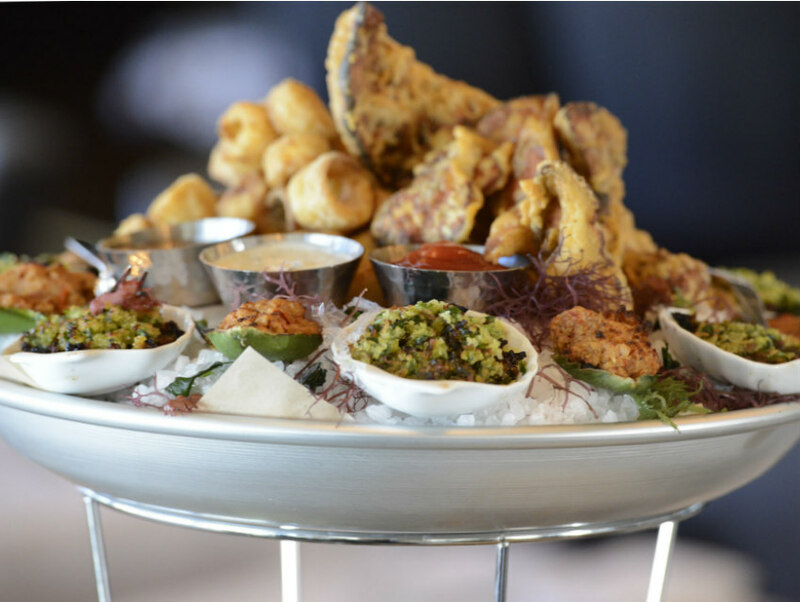 The seafood tower will only be available on Thursdays, Fridays, and Saturdays, and, due to the rarity of lobster mushrooms, availability may be limited. Make sure to show up early to get your seafood-less seafood fix.